Firebug 3 alpha was announced couple of weeks ago. This version represents the next generation of Firebug built on top of Firefox native developer tools. There are several reasons why having Firebug built on top of native developer tools in Firefox is an advantage — one of them is tight integration with the existing platform. This direction allows simple use of available platform components. This is important especially for upcoming multiprocess support in Firefox (also called Electrolysis or E10S). The goal of the Electrolysis project (“e10s” for short) is to run web content in a separate process from Firefox itself. The two major advantages of this model are security and performance. The e10s project introduces a great leap ahead in terms of security and performance, as well as putting more emphasis on the internal architecture of add-ons. The main challenge (for many extensions) is solving communication problems between processes. The add-on’s code will run in a different process (browser chrome process) from web page content (page content process) — see the diagram below. Every time an extension needs to access the web page it must use one of the available inter-process communication channels (e.g. message manager or remote debugging protocol). Direct access is no longer possible. This often means that many of the existing synchronous APIs will turn into asynchronous APIs. Developer tools, including Firebug, deal with the content in many ways. Tools usually collect a large amount of (meta) data about the debugged page and present it to the user. Various CSS and DOM inspectors not only display internal content data, but also allow the user to edit them and see live changes. All these features require heavy interaction between a tool and the page content. So Firebug, built on top of the existing developer tools infrastructure that already ensures basic interaction with the debugged page, allows us to focus more on new features and user experience. Firebug 2.0 is compatible with Firefox 30 – 36 and will support upcoming non-multiprocess browsers (as well as the recently announced browser for developers). Firebug 3.0 alpha (aka Firebug.next) is currently compatible with Firefox 35 – 36 and will support upcoming multiprocess (as well as non-multiprocess) browsers. 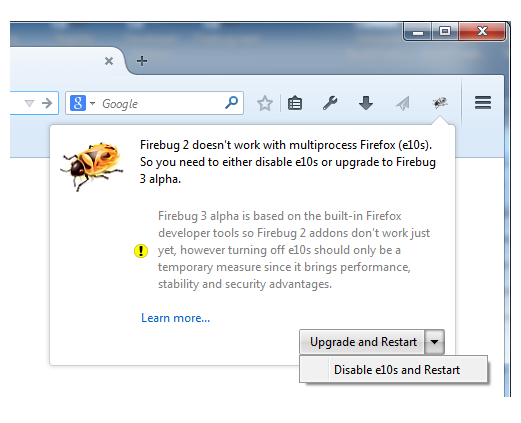 If you install Firebug 2 into a multiprocess (e10s) enabled browser, you’ll be prompted to upgrade to Firebug 3 or switch off the multiprocess support. Upgrade to Firebug 3 is definitely the recommended option. You might miss some features from Firebug 2 in Firebug 3 (it’s still in alpha phase) like Firebug extensions, but this is the right time to provide feedback and let us know what the priority features are for you. You can follow us on Twitter to be updated. Leave a comment here or on the Firebug newsgroup. displaying xhr requests right in the console by default (considering how AJAX-heavy some apps are, this is one of my favorite features) and displaying slightly expanded versions of objects and arrays in console (opening up huge trees just to find out the id of an object is something I hate about other dev tools, *cough* chrome). Lookin’ good though! Agree, these features are missing and we are working hard to have them back. Anynone?? please anyone at Mozilla can see this comment? yes please?, hello? Why isn’t Firebug as a separate plugin sunset and all functionality add to Firefox dev tools? The chocolate meets the peanut butter and everyone is happy. One of our goals is to bring Firebug UX into native devtools, so yes, features are mixing to devtotols. Firebug itself focuses on extensibility (making sure that devtools are actually extensible) and pro features. When in tab “Console” was easyer the old accordion system with sub tabs, instead of new multi dialog popup.